With the increased size of the championship from 400 teams last year to just over 600 teams this year, 4 new divisions were added: Tesla, Carson, Carver, and Hopper. 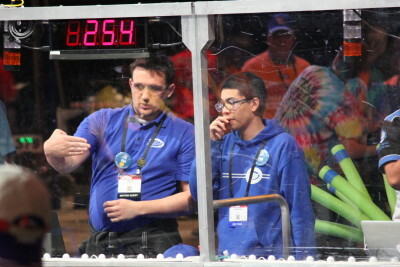 Team 254 was a member of the Carson division and ended up seeding first, picking teams 973, 999, and 4499, and then unfortunately experiencing some bad luck and being eliminated in divisional quarterfinals. However, the team received the Industrial Design Award for their outstanding robot and had a great time in St. Louis on Sunday. The team played a total of 10 qualification matches on Thursday and Friday. Some matches were tough, but in others the team scored more than 240 points!  By the end of Friday, 254 seeded first with a qualification average of 211.1, the highest of any team at the Championship, let alone any official FIRST event. 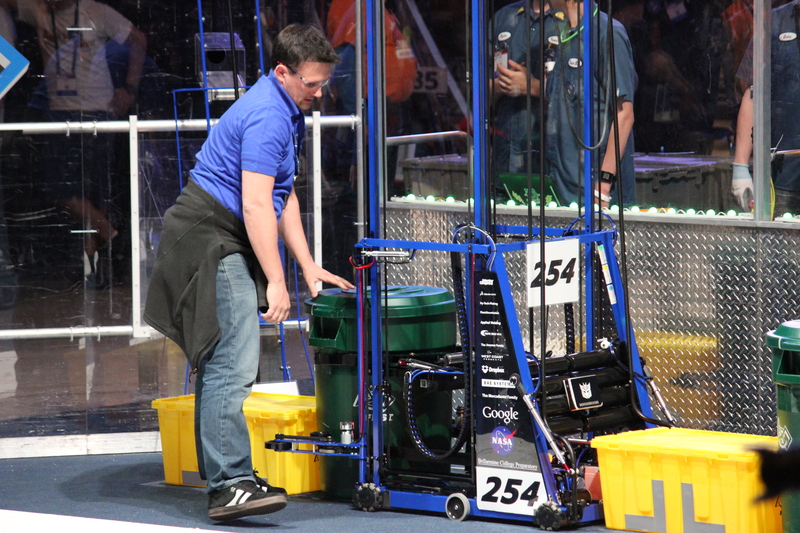 Here are some videos of our Qual matches, recorded by Team 1511: Rolling Thunder. We had to wake up very early on Thursday and Friday to guarantee good seats in the stands for our scouts! 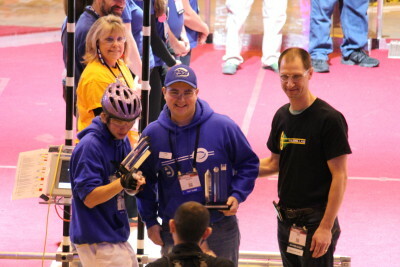 The team received the Industrial Design Award. This award celebrates form and function in an efficiently designed machine that effectively addresses the game challenge. The judges were impressed with the robot's ability to stack effectively both from the landfill and from the human player station by using a tethered ramp. This year, awards were shared between 2 divisions (about 150 teams total), so to receive the award was quiet prestigious! 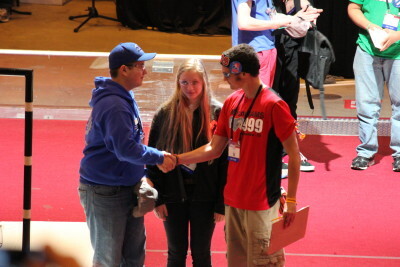 During Alliance Selection, Team 254 selected Teams 973: The Greybots, 999: The MechaRams, and 4499: The Highlanders. The alliance was hoping to strike a powerful balance between stacking from both the landfill and human player stations and using fast can grabbers to ensure we would always be able to put up as many stacks as possible. 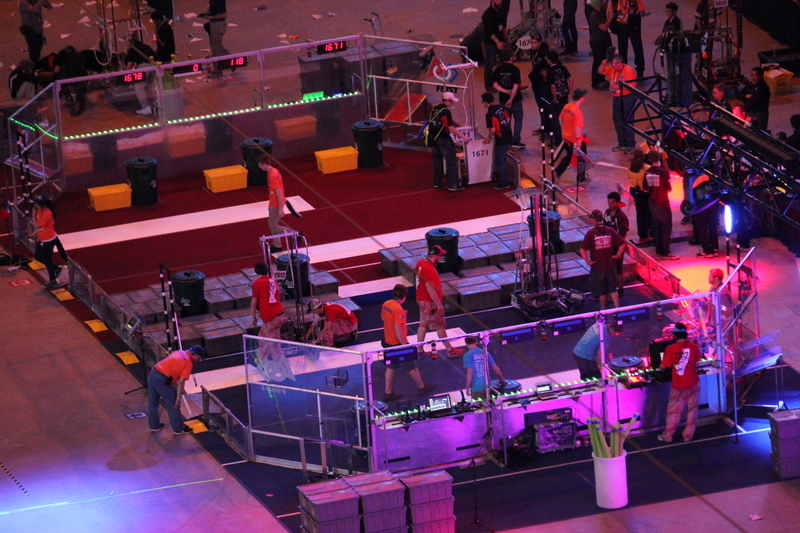 However, despite all of the alliance's efforts, they were sadly eliminated in the quarterfinals. 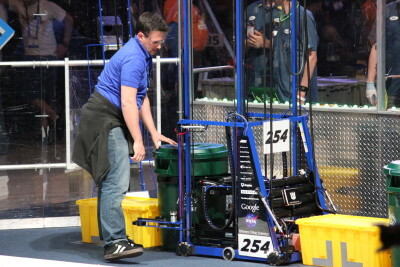 In their first match, buggy autonomous modes meant 254 was unable to get the 20pt tote stack. Then, after playing a nearly perfect match after that, Team 973 accidentally set down their last second stack on a noodle, causing that stack to fall over and domino another stack. Despite the terrible score, the alliance hoped that they could score at least 215 points in their second match to keep themselves qualified for the semi-finals. Once again, however, 973 ran into 254 during auto, disrupting it and scattering the yellow totes in the way of the cans on the field. Then, after auto, Team 999 tipped over onto the landfill, blocking many of the totes 973 needed to make their stacks. It was an unfortunate series of events and bad luck and the whole alliance was bummed to have been knocked out so early. 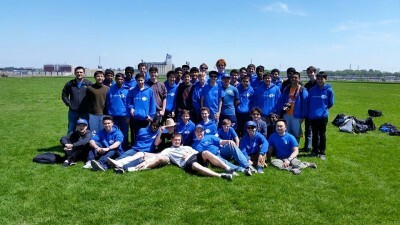 However, the boys didn't stay upset for long, we quickly ran around and helped our friends (1114, 971, 1678) competing in other divisions. 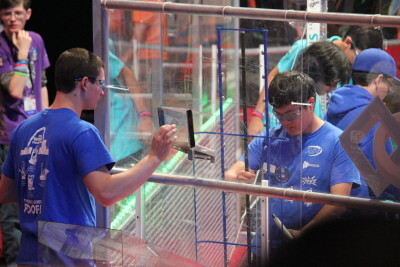 We loaned batteries to 1114, and cheered on our friends on 1678 as they went on to win the entire World Championship. The team cheered on our friends on 1678, 118, and 1671 as they battled for the World Championship title. On Sunday, students got to choose to either wake up at 10am and go to the City Museum or sleep in and meet up with the others at the Arch at 1pm. It was a lot of fun and really relaxing to hang out and take photos under the Arch for an hour before heading to the airport. Overall, FRC Worlds this year was one of the best in a long time. All the students had a ton of fun and no one was really bummed for that long. We're excited to return and hoping to do better next year! The whole team got to relax and visit the Arch on Sunday.